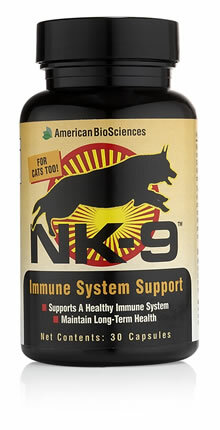 NK-9 Supplement For Dogs | Vitamins For Cats | Best Dog Vitamins - American BioSciences Inc. Active Ingredients: AHCC hybridized mushroom extract. If you have a dog or cat that you love—give your full attention to what’s below. Because you’re going to finally learn the secret to keeping them healthy and helping them bounce back if they get sick. Many caring pet owners watch helplessly as their furry friends get ill, withdraw, and sometimes, even worse. It’s a tragedy because it doesn’t always have to go that way. A perfect example can be found with Joyce. Her veterinarian had made a frightening diagnosis for Jacque, Joyce’s 10-year-old apricot-colored standard poodle. The steps the vet recommended were not acceptable to Joyce. Joyce decided to search for an alternative and supplements for dogs that could help. She knew that ImmPower was an immune enhancing supplement for humans, but she didn’t know if there was anything like it for her dog, Jacque. A much healthier and happier dog. Joyce’s immune system and her dog’s immune system both contain cells called Natural Killer (NK) cells, the most important white blood cells in the immune system. 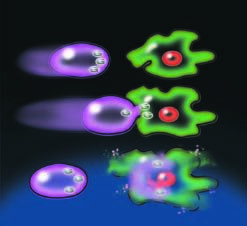 These cells are designed to defend against foreign or dangerous substances that invade her body, as well as Jacque’s (see illustration). Natural Killer (NK) cells are your immune system’s frontline defense. They inject invaders with “hand grenades” called cytotoxic granules. The granule lysis dissolves cell membranes causing invaders to “explode” in seconds. NK-9 also helped an angel dog that helps kids. Not many dogs are allowed to visit seriously ill kids in the intensive care unit of a hospital— or mingle with older individuals in assisted living facilities who seem to thrive on the love and affection of a pet. Maggie the therapy dog has these special privileges. In just one year, she visited over 3,500 people, including 350 children at the University of Massachusetts Memorial Children’s Medical Center. She snuggled with sick kids too weak to reach out and pet her. 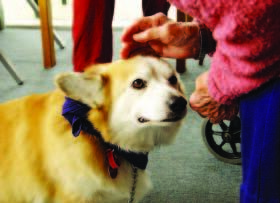 Maggie brought joy and memories to people who had forgotten their own cherished pets from times gone by. She’s been called an angel and a dog that works magic. Then in August 2006, Maggie got very sick too. Making it to the holidays looked doubtful, because she couldn’t take anymore of the vet’s treatments. Fortunately, Maggie’s owner, Mike Kewley, founder of Shrewsbury Paws, an animal therapy company, heard about NK-9. 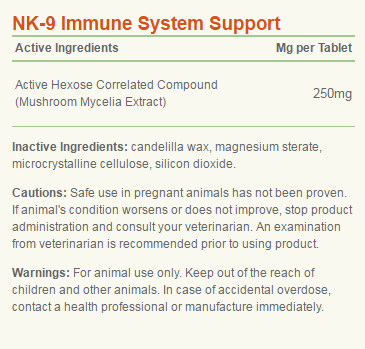 How does NK-9 work to bulletproof your pet’s immune system? Veterinarian researchers at Nihon University, the largest university in Japan, discovered why NK–9 works so well. They conducted a study with dogs. 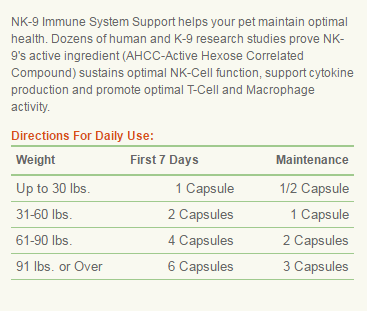 The results showed that Natural Killer cell activity almost tripled from this supplement for dogs. Even more impressively, it only took seven days! NK-9 also nearly tripled the activity of large immune system fighters called macrophages. When intruders get into your dog’s tissues, the macrophages are there waiting to literally eat the invaders and render them harmless to your pet. 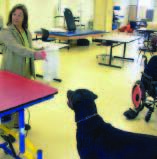 Kellie Cosby, Cosby’s Therapy Animals, Inc.
*These statements have not been evaluated by the Food & Drug Administration. Our products are not intended to diagnose, treat, cure or prevent any disease. Individual results may vary.